The Apple iPad Mini 4 might not get a successor next year. Barclays analysts recently reported, that Apple will introduce three new iPads in March of 2017. The iPad Mini 4 will not get a replacement, however. Instead, a new 9.7 inch iPad will be introduced as an entry level device. A new 10.9 inch tablet may turn out to be bezel-less. 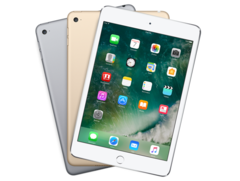 Apple may introduce three new iPads in March of 2017, Blayne Curtis, Christopher Hemmelgarn, Thomas O'Malley, and Jerry Zhang, analysts at Barclays Research reported as part of their recent research report. The iPad Mini 4 may not get a successor but will stay part of the iPad lineup. A new 10.9 inch iPad Pro will inherit the same physical footprint of the 9.7 inch iPad Pro which will make it bezel-less and most likely the first iPad without a physical Home Button. The 9.7 inch iPad Pro will be refreshed as a low-cost model. Both, the new 10.9 inch model and a refreshed 12.9 inch iPad Pro will inherit the TrueTone display from the current 9.7 inch iPad Pro. Also all models will still feature headphone jacks and come with a quad-microphone array. The new 12,9 inch iPad Pro will get the same 12 megapixel camera with TrueTone flash, that premiered on the 9.7 inch iPad Pro.